Mart Tool is a new key programmer for 2015-2018 new Land Rover Freelander . Mart Tool is designed to add new keys and program new keys when all keys lost for Land Rover and Jaguar KVM keys with Number FK72 HPLA. 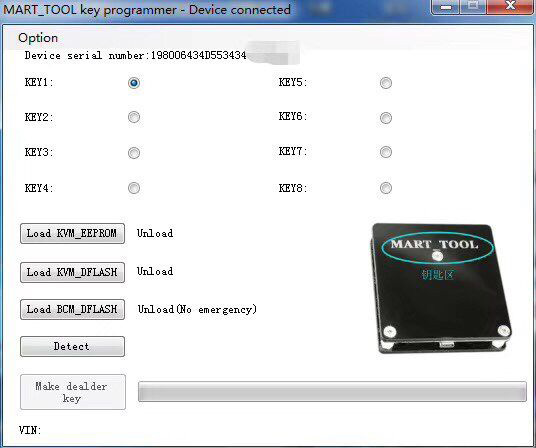 Mart Tool is designed to add new keys and program new keys when all keys lost for Landrover and Jaguar KVM keys with Number FK72 HPLA from 2015-2018. Firstly You need to use other devices (like VVDI Prog,Xprog ) to read out the D-Flash and EEE data in the KVM, then use Mart tool to generate new key and data, finally write back to KVM. 4. If you have "Network Error" after install the software, please download the Mart Tool Client and run, it will be solved.